Last week we posted a piece on the campaign to get the Grand Rapids Public School Board to take a stand against South African Apartheid in 1985. The School Board, in this instance, voted 7 – 2 in favor of divesting from corporations or financial institutions that were profiting off of the Apartheid system in South Africa. We have also documented in a previous posting that the City of Grand Rapids passed a resolution in 1982 in favor of divesting from South Africa and within a few years took action to formally divest. 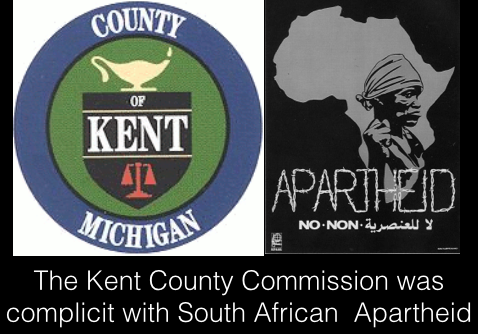 The Grand Rapids Anti-Apartheid Movement was also attempting to getting the Kent County Commission to take a similar stance, by adopting a resolution and divesting from all corporations and financial institutions economically benefiting from South African Apartheid. Doug Van Doren, who was a member of the South Africa Working Group of IGE, had sent two letters in July and August of 1985 The letters were a follow up to when members of the South Africa Working Group spoke before the County Commissioners asking them to follow the City Commission and take a stand against the racist Apartheid regime in South Africa. You need to be aware that action taken in the West Michigan area has an impact out of proportion to our size. This is due to the strong religious and ethnic ties people of this area have to the present South African government. The only city of a smaller size and the only mid-west city visited when the Eloff Commission from South Africa came to the US, to see if they could get away with action against Bishop Tutu, was Grand Rapids. To withdraw support from a racist, violent and repressive regime is the right and moral thing to do. I am certain that you and the citizens of Kent County do not one penny of our money to support, directly or indirectly, physically or psychologically, a regime that discriminately governs the life of its citizens solely by the color of their skin. In addition, divestiture makes a statement that the Kent County Board of Commissioners is against racist behavior wherever it may be found. 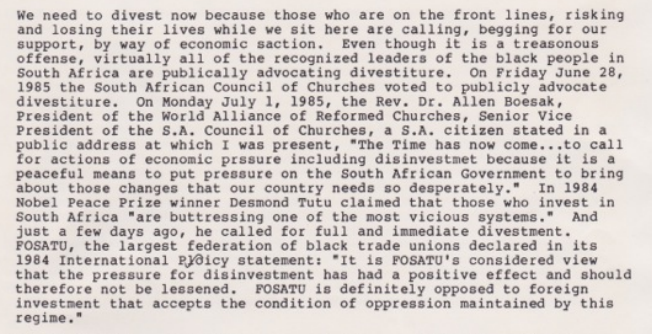 The County Commission did not support divestment in South Africa, therefore demonstrating their complicity in the racist Apartheid government in South Africa. This entry was posted in Anti-Apartheid Movement and tagged Dutch CRC Church and Apartheid, Grand Rapids Anti-Apartheid Movement, Kent County Commission and South African Apartheid. Bookmark the permalink. Actually, it was the county treasurer, Jack Boerema, who was responsible for county investments. Mr. Boerema just recently passed away so it’s impossible to ask him why the county was invested in S. Africa. Candice, while it is true that Mr. Boerema was the treasurer at the time, the County Commission was asked to pass a resolution, similar to what the City had passed. The Commission had the power to take such a stance and they chose not to in 1985.